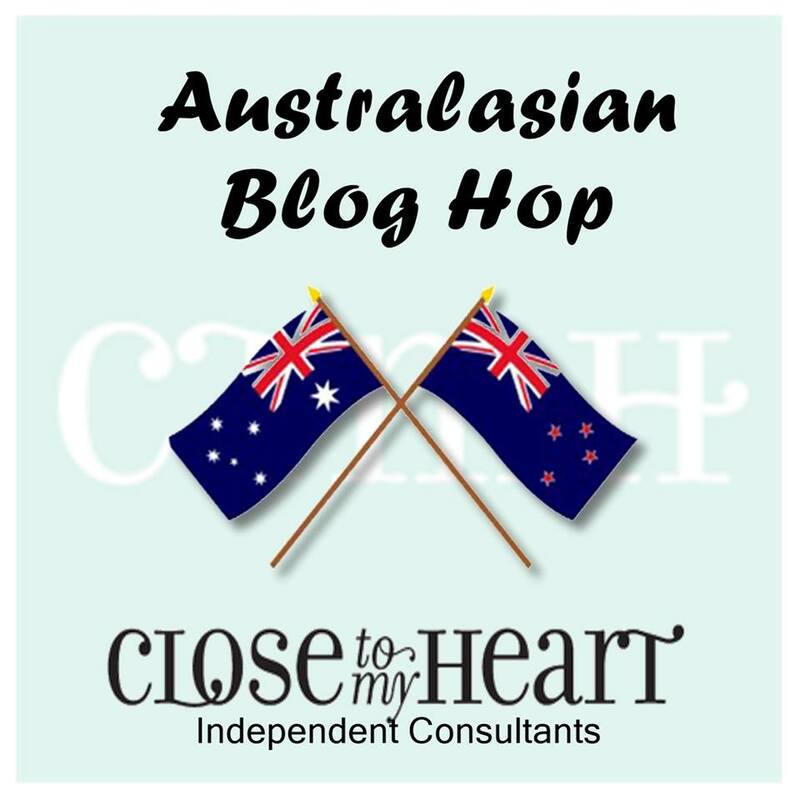 Hello and welcome aboard our Close To My Heart January 2016 Stamp of the Month Australasian Blog Hop. 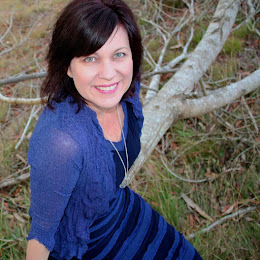 If you have arrived here from Shaunna's Blog Passionate About Pages, you are in the right place. If you landed here by accident, no problem, please join in by following the link at the end of this post. Today, I would like to share with you a set of six cards I have created that features the January Stamp of the Month, Beloved Bouquet. 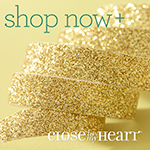 This stamp set is available only in January 2016 for $27, or for just $7.50 when you spend $75 or more. 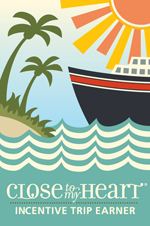 Love is in the air with the January Stamp of the Month from Close To My Heart! 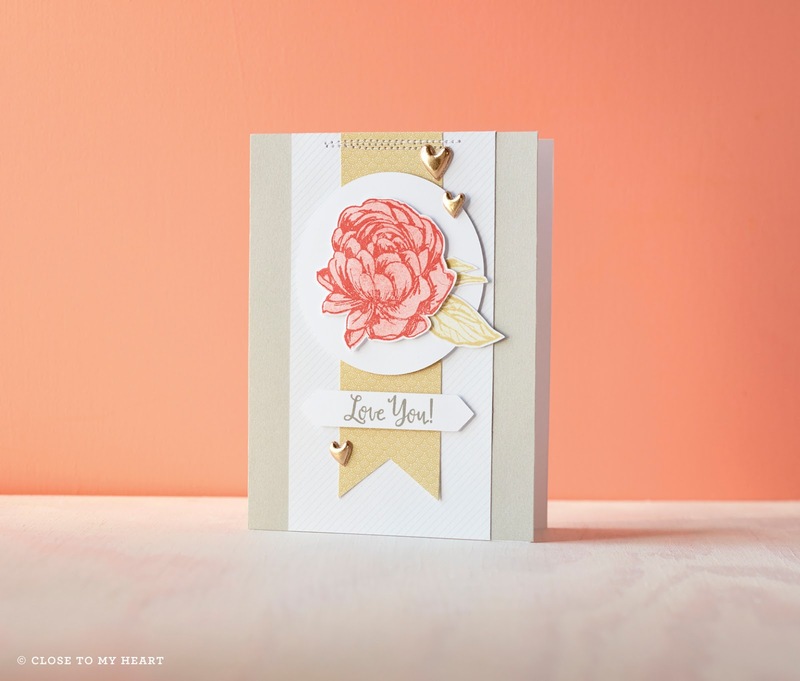 And with this new stamp set, love can also be on your card designs, on your page layouts, in your planner and on your designer decor items! Love can be everywhere! 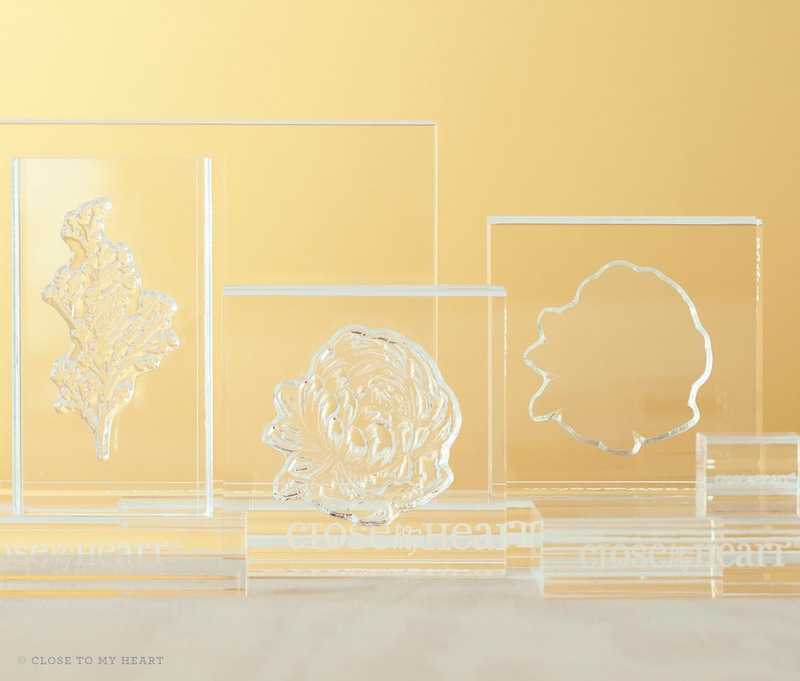 The stamp set features solid stamps for background stamping and stamps with finely detailed leaf and flower images for stamping the foreground. You can use first and second generation stamping with the same colour to create a subtle contrast between the background and foreground, or stamp with different ink colours for a more dramatic effect- the choice is up to you. 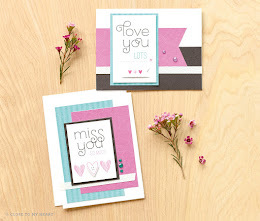 Here is the set of six cards that I have created featuring stamps from Beloved Bouquet. 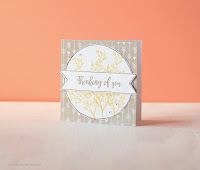 I borrowed the layout from a cute card designed by Dawn Heathwood and I raided my scraps to choose the Cardstock colours for each of the cards (I love an opportunity to use up some of my scraps). To create these cards, I began with a 5 1/2" x 8 1/2" Black Cardstock base, scored and folded in half at 4 1/4" and creased using the Bone Folder. I also used Black Cardstock to mount the two White Daisy Cardstock pieces on the card. 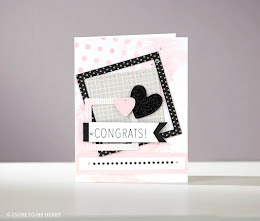 I love the way the black creates a dramatic contrast to the white and colour on the cards. I created the dovetailed strip down the side of the card using a 2" strip of White Daisy Cardstock and randomly stamping the flower outline in Black ink. That actually looked quite stunning on its own, so I'll be using that idea again in a future card design. 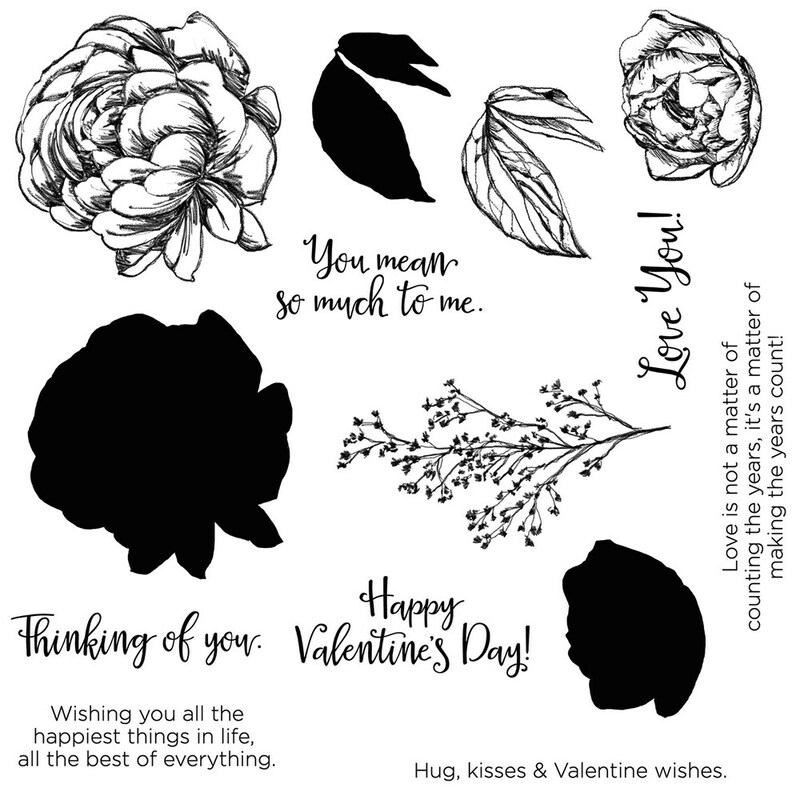 The various sentiments on the cards have been stamped in Black ink and the background stamping on the White Daisy Cardstock featuring the sentiment has been stamped with Fern ink. The leaves were stamped in Fern for the background stamp and in Topiary for the foreground stamp. The flowers have been stamped using a variety of ink colours to coordinate with the selected Cardstock. For some of the flowers I used first and second generation stamping in the same colour, and for others I used different colours for the background and foreground stamps. I cut a 1/2" x 4" strip of Black Glitter Paper, placed it at 2" on the card to add a bit of shimmer to the card design before adhering the leaves and flowers using Thin 3-D Foam Tape and 3-D Foam Tape to create varying heights on the card front. Thank you for visiting my Blog to check out my special cards featuring the January Stamp of the Month, Beloved Bouquet. 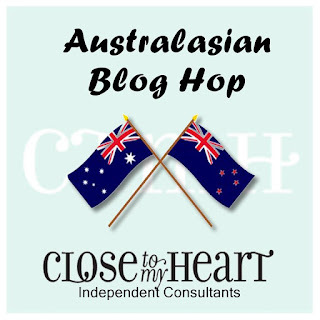 I would love it if you could leave a comment below before you hop to the next stop on our Australasian Blog Hop, Wendy's Blog Expressions of the Heart. Remember, the January Stamp of the Month, Beloved Bouquet is only available throughout January 2016 from your Close To My Heart Independent Consultant for $27, or for just $7.50 when you spend $75 or more. Very lovely - I do like the use of the black outline image as a background to tie it all together. Love the layout of the card too. Wow! 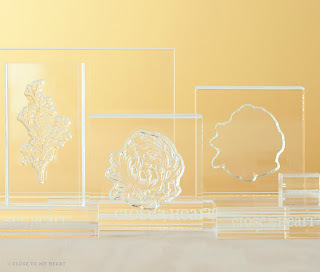 These are tres elegant! 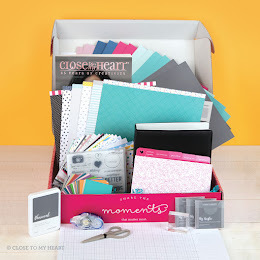 Wow, these are so pretty and a great way to show them filled and uncoloured in the same card! 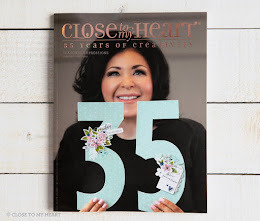 These are so beautiful Denise! I just love the contrast of black and white with the vibrant colours! Beautifully designed cards, all colour combinations really work well together. These look amazing. I really like the way you've used the black as a background paper. They are gorgeous Denise! I love the colours! OMG it doesn't look like anyone told you how FABULOUS these are! Just kidding, it looks like everyone loved them as much as I do! Beautiful job! 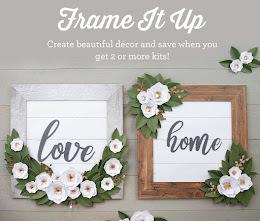 Can you list the stamp colors you used for the flowers?